Explanation: As far as pulsars go, PSR B1509-58 appears young. Light from the supernova explosion that gave birth to it would have first reached Earth some 1,700 years ago. The magnetized, 20 kilometer-diameter neutron star spins 7 times per second, a cosmic dynamo that powers a wind of charged particles. The energetic wind creates the surrounding nebula's X-ray glow in this tantalizing image from the Chandra X-ray Observatory. Low energy X-rays are in red, medium energies in green, and high energies in blue. The pulsar itself is in the bright central region. 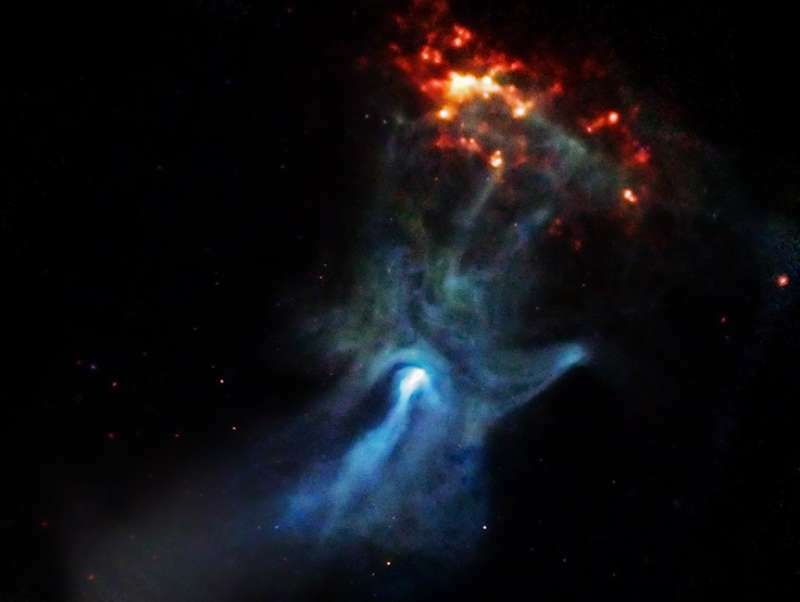 Remarkably, the nebula's tantalizing, complicated structure resembles a hand. PSR B1509-58 is about 17,000 light-years away in the southern constellation Circinus. At that distance the Chandra image spans 100 light-years.